Bloombergtown from Elizabeth Benjamin on Vimeo. Tonight I want to talk to you about what I believe is a key issue in this campaign – Republican Mike Bloomberg’s self-serving desire to do away with the term limits law that New Yorkers voted for not once, but twice. He ignored New Yorkers’ voices and votes in a clear violation of the will of the people. Elections are an opportunity for voters to differentiate between candidates and their vision for the office that they seek. And this is an issue that I believe clearly defines who my Republican opponent is and who I am. I grew up in Bedford Stuyvesant – the son of an appellate court judge, and a public school teacher. I grew up in a household where we were taught a deep and abiding respect for the law – and for the freedoms that so many fought so hard to secure for us. And I learned from my father that no one – regardless of their skin color, their income level, or their neighborhood – is above the law. I understand very well that at first glance this issue may have appeared to be little more than an ill-advised decision on the part of the Mayor. But I believe it is much more than that. I believe New Yorkers have the right to have their votes respected. And I believe that Michael Bloomberg’s complete and utter disregard for the democratic process was a defining moment for all of us. There are some things that are non-negotiable including the right to vote and the duty of elected officials to uphold that right. Our country and our city have a rich history of people who have fought for basic freedoms. These fundamental rights and this battle, transcend race, age, and gender. Abraham Lincoln, Elizabeth Cady Stanton, Rosa Parks and Dr. Martin Luther King, Jr were never afraid to stand up for what they believed. They continued to fight in the face of great adversity. In 1848, though they faced major hurdles, and public scorn, women gathered at the Seneca Falls Convention to make their voices heard and to advocate for the right to vote – a right they didn’t receive until 72 years later, in 1920. In 1963, Dr. Martin Luther King, Jr. gave his I have Dream Speech. Thousands marched with him to stand up for equal rights – the right to vote, without being suppressed among them. Today, as I campaign throughout the five boroughs, those who have immigrated here tell me – I came to the United States so I could be free to vote how I choose. This is right New Yorkers exercised when they voted for term limits. We’ve come so far – how can we back down now simply because of one man’s selfish actions? We cannot and will not give up on what those before us worked so hard to accomplish. The people of this city went to the polls in November of 1993, and after an extensive debate on the pros and cons of term limits, they voted overwhelmingly to limit the number of terms that a mayor could serve. And, once again in November of 1996, after much discussion, New Yorkers affirmed their decision – no mayor, regardless of the circumstances, should serve more than two terms. At the time, a number of us disagreed with the concept of term limits, myself included, but we accepted the will of the electorate. The wisdom of New York City voters and their unflinching belief in term limits, was reaffirmed, not by a third vote, but during one of the most trying times that we have faced as a nation. In the aftermath of the greatest tragedy ever to confront the city – September 11, 2001 – former Mayor Rudy Giuliani asked that the New York State legislature grant him a stay as Mayor. Like Mike Bloomberg, he too believed that he – and only he – could steer us through the difficult days ahead. But once again, New Yorkers cried foul. Republican Rudy Giuliani was wrong for trying to stay in office then, and Republican Mayor Michael Bloomberg is wrong for trying to stay in office now. When Michael Bloomberg ran for Mayor in 2001, he knew in that he could only serve two terms. He actually said that it would be a “disgrace” for term limits to be overturned without the voters having a say. In fact, he even went as far as vetoing a bill by the City Council which attempted to extend the tenure of council members. But, when he realized his future ambitions, to be president or vice president, would not come to pass – he went back on his word. Ironic, since my opponent claims he’s an independent voice – progress, not politics he says. I would argue that what he did is the worst kind of politics there is. The mayor’s decision was not made overnight. It is now known that as early as spring of 2008 he was already discussing his plans to undo term limits so he could run again. But instead of asking voters for a referendum – instead of being forthright with his intentions, he ignored the voters. Is that progress, or politics? POLITICS! When Ron Lauder, the person most responsible for imposing term limits back in 1993, took issue with the Mayor’s actions – Mike Bloomberg cut a deal. In return for his silence, the mayor gave Ron Lauder a seat on the city’s Charter Revision Commission. This ought to insult every voter that went to the polls in support of term limits. He directed community organizations—that depend on city contracts and the mayor’s own private donations—to speak out on behalf of extending term limits. He organized 70 men and women to arrive early and take up five rows of seats in the City Council’s chambers—crowding out New Yorkers who wished to express their opposition to the term-limits extension. It was clear that his actions were based solely on self interest – but in the end, it really does not matter why Mayor Bloomberg did it. I am here today to tell him that he was wrong. And it was wrong that in an attempt to defend the indefensible, Mayor Bloomberg, said that he was the only person equipped to guide us through the economic crisis we are facing. • Our unemployment rate increased from 6% to over 10% – that’s the highest it’s been in 16 years. It’s higher than the rest of the state, and higher than the national average. No wonder middle class families are leaving our city because they can’t afford to stay. So much for Michael Bloomberg’s logic for overruling the will of the people. It’s clear that our City cannot afford another four years of Mike Bloomberg. And the truth is, Mike Bloomberg does not deserve another four years in office. I am running for mayor to redeem the promise that our government made to its people. I am running for mayor because I believe that under Mike Bloomberg’s watch – not only has our middle class suffered, but he violated their trust on a fundamental issue. I believe it is time for us to re-evaluate our priorities. It’s time that we help each and every New Yorker to have the same opportunities that this City allowed my grandparents and parents to have. The same opportunities I had. For eight years Mike Bloomberg has chosen the wealthy, developers, and Wall Street over working families. And we’ve struggled as a result. I will do the things that Mike Bloomberg has not done over the last eight years. I will truly expand access to affordable housing by creating a Mitchell Lama program for the 21st Century. I will support small businesses and work collaboratively with community and business partners to build a dynamic post-boom economy that focuses on creating living-wage jobs. I will put the public back in public education and ensure our children are prepared for the future. I will reduce the impossibly high fares, fines, taxes and fees that hit our middle class the hardest and I will root out waste – starting with agencies like the Department of Education which offers millions in no-bid contracts each year. And as one of my first acts as mayor I will call for a referendum on term limits – I will do what Michael Bloomberg did not – and I will allow the voters of this city to make their voices heard. Does the richest man in New York City get to live by one set of rules – while the rest of us live by another? In 20 years we should be able to look at our children, and our grandchildren, and tell them that we stood up for our right to vote – that we honored those who marched, who protested, who lost their lives defending this most basic right. I grew up in a home where early on I learned, from my mother and father the honor of public service. I was taught that you stand tallest when you uphold the law that protects the most vulnerable among us. I promise you, that’s the kind of Mayor I will be. I will be accountable to you – I will listen to you. And I will never put my own self interest, over the best interests of this city. A year to the day that he overruled our will – we will send a clear message: we didn’t support what you did then; we won’t stand for it now. “In the end, however, what really matters is this image and the fact that Thompson can say he has the president’s support. The average voter will likely neither know nor care about Obama’s enthusiasm level where this race is concerned. 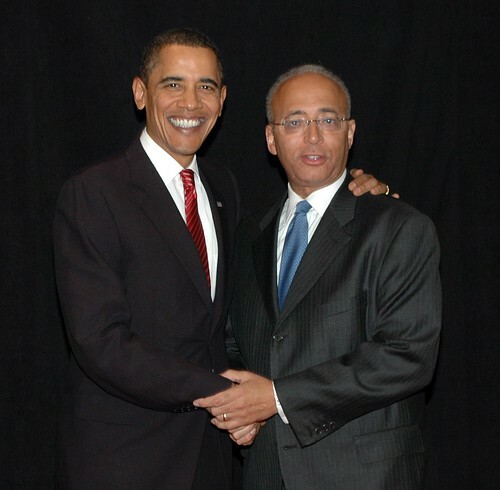 “Our great city controller, our candidate for mayor, my friend Billy Thompson, is in the house.” — President Barack Obama, during a Democratic fundraiser last night at the Hammerstein Ballroom.